One broken heart. Two grieving minds. To Lorna Ibe, Departmental Manager with one of London's multi-channel retailers, Valentine's Day lost its romantic flavour years ago. An unplanned holiday to New Jersey is her perfect getaway from the stress and emotional turmoil locked in her heart, just what she needs to take her mind off her troubles. That's until she runs into Logan. Magazine publisher, Logan Blake has had his fair share of stress in the past few years. When his sister asks him to drop off old clothes to charity, he has a minor accident in front of the charity shop where Lorna volunteers. When he sets eyes on her bare midriff as she wipes the display window, he clears his busy schedule to volunteer his time. Two burdened hearts afraid to get entwined. One Stolen Valentine Kiss. Will Valentine season bring them romance or will their fears keep them apart? Logan's left arm draped round her waistline as if he couldn't bear to be away from her. ''Are you trying to make a few women jealous?'' Lorna breathed in his ear, nearly tempted to nibble his fair earlobe. ''Why do you say that?'' he whispered back, his gaze darting towards the couple standing a few yards from them. ''Too many women have given me knife edge glances already. I feel the sharp end of their stinging glare. As I don't know them...I can only conclude they want you...and they think am standing in their way.'' A cool smile passed her lips. She shivered when his breath caressed her eyelids. His fingers, cleverly hidden from view stroked beneath her ribs absently, giving her undeniable pleasure. She tried to stand upright, but her knees still buckled. One hand reached for his abdomen. Oh, it was as taut as she expected with ridges but she didn't bargain for the piping hot desire shooting through her arm. Snatching her seared hand away, she sucked in air. ''Should I be? Is there any one of these glamorous women you fancy? I can arrange for her to come over?'' Arabella approached with a pretty blonde woman in tow. ''Logan, meet Isabella. She's a doctor in Christ Hospital. I've told her a lot about you. Isabella, keep Logan happy for awhile," she instructed. Logan's face showed no expression. Arabella nudged her. ''Are you dreaming about my brother?'' her eyes flashed angrily as they entered what must be a guest bedroom. Lorna's eyes darted round, her brain suddenly registering the other woman's intention. ''Do I look dreamy?'' she replied equally sarcastically. ''What do you do, Lorna?'' the room decorated in neutral colours of magnolia and beige soothed her wary nerves. ''Are you asking out of interest or spite?'' she retorted. ''Is that where you met my brother?'' the other woman cut in sharply. ''Yes, if you must know. Is our pep-talk going to be about Logan? You plan on warning me to stay off him, right?'' her gaze raked Arabella's flesh. ''Does he know you're bent on securing him a wife?'' she countered tartly. Arabella's gaze mirrored barely disguised anger for a split second. I am Stella Eromonsere-Ajanaku, a fun loving mother of two, married to my very own gorgeous alpha male. I recently 'retired' from an eighteen stint working as a Quality Assurance Manager. Writing romance novels is an exciting adventure. In 2010, I created Flirty & Feisty Romance Novels. There are six contemporary romance novels in the kitty, varying from sweet & sensual to spicy hot & steamy - LOITERING SHADOWS, STORMY DEFENSE, BEYOND the LADY, THE GARDNER'S ICE MAIDEN, SPARKLING DAWN and HUSBAND to RENT. 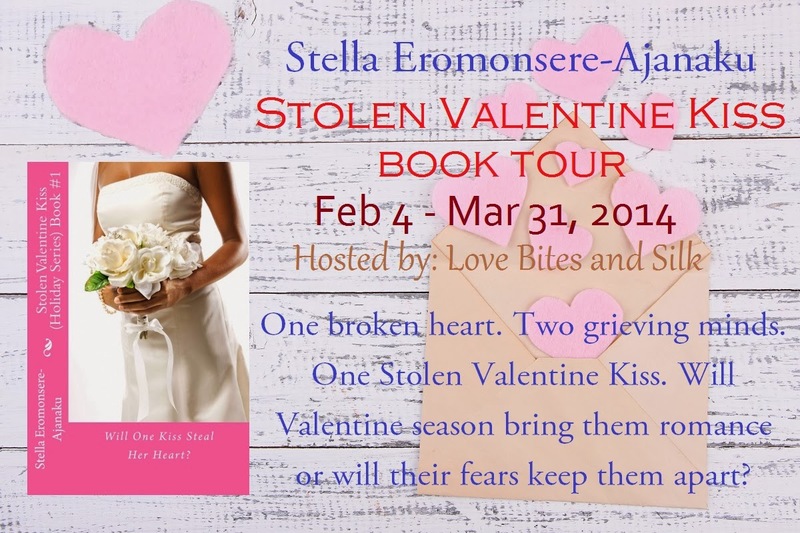 STOLEN VALENTINE KISS is my first series and my first Novella. The book tour includes a giveaway of a $15 Amazon Gift card and ebooks. Thank you, Vivienne for hosting Stolen Valentine Kiss. Happy Valentine. My best wishes to you always.